Welcome to us at Kattpost! An initiative started by the Swedish sibling hipster cats, Ozzy & Morris to put a pawsitive spin on your every day life. Together with their mistress Johanna, Ozzy & Morris have composed a monthly subscription box, or taster/gift if you prefer, which is filled to the brim every month with the best you can imagine of food, treats, toys, and accessories. We have searched near and far, at big companies and small, for a selection of products which is both varied and has a wow factor. We often choose alternative distributors that normal shops often don’t offer and who can be difficult to find on your own. In every box information about the products is included. Maybe our box can help you find your feline friend’s new favourite food, toy, or accessory? The selection criteria for the items that end up in our Kattpost are exacting, as you can imagine, since we are constantly working to achieve a varied box with the best of the products available on the market. Food and treats has to be made from natural ingredients and without any artificial additives. If we find organic alternatives, you’ll be the first to receive them! The same goes for toys and accessories which are chosen to challenge mind and body. You won’t get any cheap advertising tat from us! The environment and social responsibility are important issues to us. We search amongst big companies and small, near and far, to find products which are as good for you and your cat, as they are for the environment. Sadly the pet products industry is still behind in these issues, but the environmentally friendly products that do exist will end up in our box sooner or later! Being our friend should be easy! That’s why our subscription has no minimum length, a full right to withdraw, and is easy to cancel. The most important thing for us is that you and your feline friend(s) are happy. Environmental and social issues are near and dear to Johanna’s heart, mistress of Ozzy & Morris, and the founder of Kattost and JDOTS (climate friendly interior decoration). 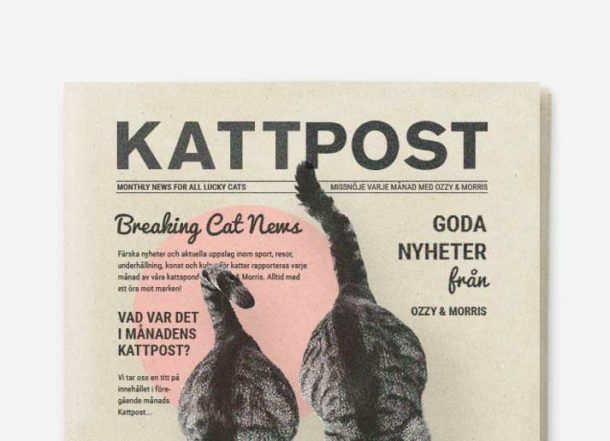 With Kattpost, she hopes to reach a wide enough audience to eventually be able to allocate part of the company’s profits to charitable work promoting cat’s wellbeing. Currently Kattpost is engaged with charity through individual and specific actions, which you as a friend of Kattpost will be able to follow through our news letter and through FB and Instagram. We encourage you to take part of our news updates here and to follow us on our journey towards a more meownificent life!